Wishing everyone a Happy Fall! This photo was taken last year during fall season. To visit and see that post you can click HERE. Hi Julie! I did go back and visit your post at the farm. What a wonderful place! Isn't there just something about little goats and sheep? They are so sweet looking. Thanks so much for popping in to see me and it is good to be home. I'm excited about Fall! yay!! Happy Fall, sweet friend. Hugs! I hope you resurrect him, he's cute. :) Have a great Wednesday! 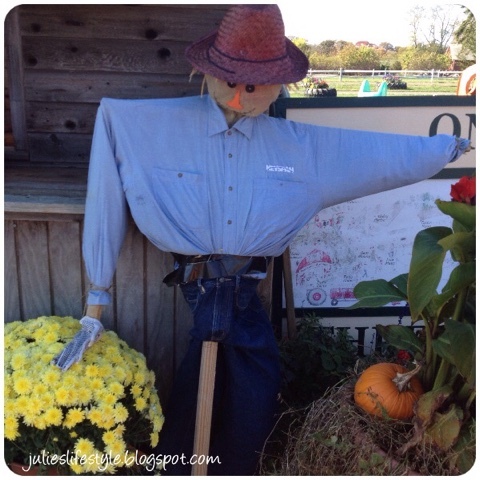 Great post of last year and love the scarecrow. Have a great rest of the week. 90's again today...... No Fall here. Happy Fall Julie! The scarecrow is cute and I enjoyed reading about your trip to the farm with your family! We have a farm very similar to that about 5 minutes from our house and we love to visit in the fall. It makes a perfect fall outing. Thank you for the visits and I hope you are having a great week. Well Mr. Scarecrow says it all. Happy Fall. It's just about that time again this year, Julie! Looking forward to my own trip to the farm! Really cute fall scene Julie. He's a handsome guy! Visited your post about the farm - looks like a great place to spend the day!